Improve Productivity With An Automated Palletizer | ROBOVIC Inc.
home › blog › how can an automated palletizer optimize production while making up for lack of manpower ? Companies are turning more and more towards automation in order to increase production capacity and offset the growing labor shortage. According to figures from the Québec institute, one million workers will retire between 2015-2024 and 630,000 more by 2030. Palletizing is a solution of assembling products on a pallet for shipping. Integrating automation solutions such as an automated palletizer is aimed to help companies enhance production in their fields. Installing robotic palletizing systems will undeniably result in reassigning employees who will nonetheless remain essential to ensure the company’s efficiency. Undoubtedly, the human/robot collaboration will enable employees to dedicate their time and energy to the work load with the added value of robots undertaking the repetitive, physically demanding and even dangerous operations. In the long run, transitioning employees to new positions would provide the opportunity to achieve higher productivity levels and less physically demanding jobs. In terms of speed, an automated palletizer is able to palletize products such as boxes every second or sixty boxes per minute. By rendering the process exclusively robotic, movement is more precise and constant speed produces quality product. 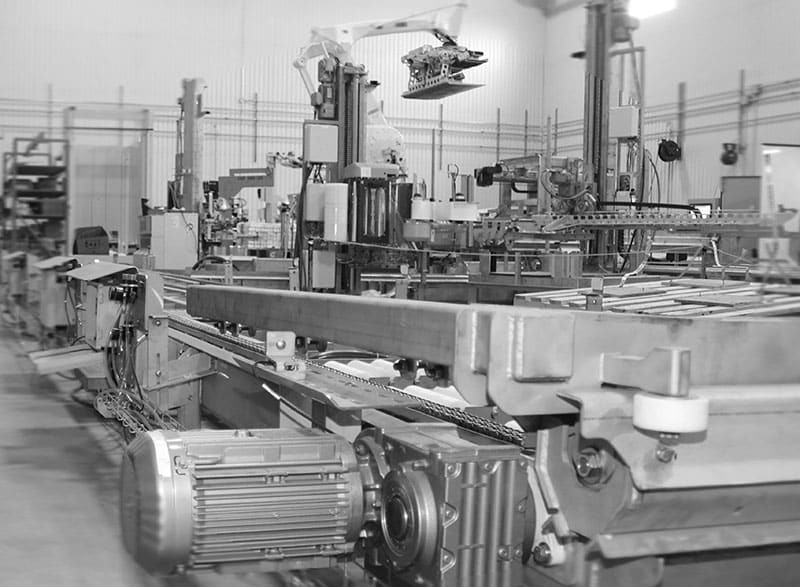 The use of robots eliminates problems associated with fatigue, distraction and the effects of redundancy which often affect the quality of the finished products. A palletizer works autonomously, it can operate continuously 24/7 and only needs one operator to monitor multiple automated systems. For companies working with 3 shifts, part of the workforce could be reassigned to new positions. In addition, automated palletizers can operate at temperatures ranging from + 4 ° C to + 50 ° C, reducing heating and cooling costs. Robotic automation helps improve working conditions by eliminating repetitive and health-damaging tasks such as handling heavy, large or difficult to handle bags or boxes. Integrating articulated arms makes it easy to lift these loads before stacking them on the pallets. 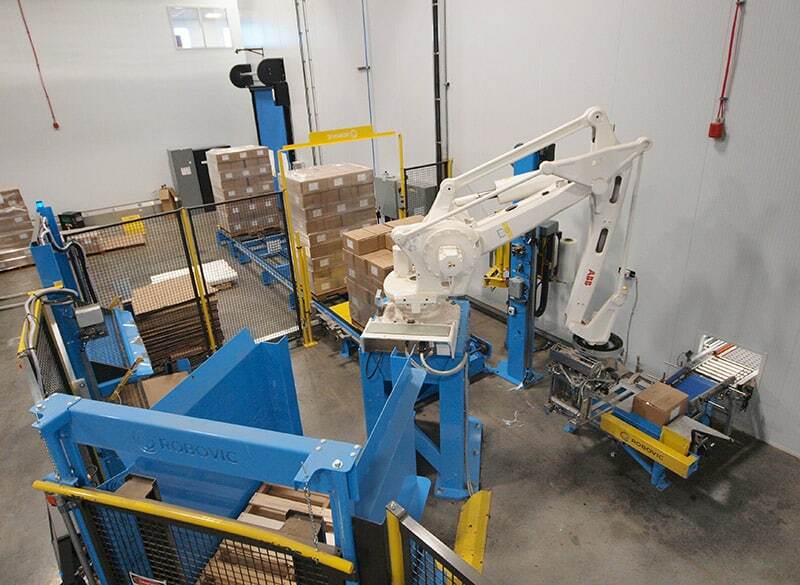 Automated palletizers are designed to repeat movement at a constant speed flawlessly. Robots are considered the most reliable element in a factory. ABB, our supplier of articulated arms, estimates that its robots are able to work up to 400,000 hours (+ 45 years) before possible technical failure. In conclusion, benefits related to automation are not only related to the workforce reassigned to vacant positions but also related to productivity gains. In fact, installing an automated palletizer in a company would optimize working conditions, increase the company’s capacity and fill the lack of manpower by reassigning employees used to palletize to other positions available in the company. Today, the challenges of automation are crucial, they represent significant solutions which helps companies to remain competitive within their field. Big bag handling : The difference between the fully automatic and semi-automatic system ! What are the advantages of an automatic tote system vs semi-automatic ?